A hip, accessible, and practical guide for artists and creative people looking to tarot for guidance and inspiration in the tradition of The Secret Language of Birthdays and Steal Like an Artist. What if the path to creativity was not as challenging as everyone thinks? What if you could find that spark, plot twist, or next project by simply looking at your life and your art through a different lens? Written for novices and seasoned readers alike, The Creative Tarot is a unique guidebook that reimagines tarot cards and the ways they can boost the creative process. 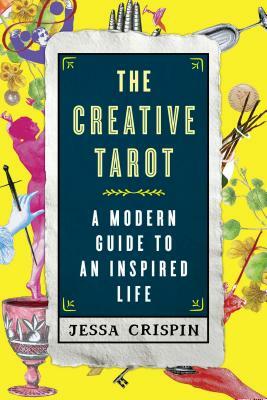 Jessa Crispin guides you through the intuitive world of the tarot to get those creative juices flowing again. Thought to be esoteric and mystical, tarot cards are approachable and endlessly helpful to overcoming creative blocks. Crispin offers spiritual readings of the cards, practical information for the uninspired artist, and a wealth of fascinating anecdotes about famous artists including Virginia Woolf, Rembrandt, and David Bowie, and how they found inspiration. With five original tarot spreads and beautiful illustrations throughout, The Creative Tarot is an accessible, colorful guide that demystifies both the tarot and the creative process. Jessa Crispin is the editor and founder of Bookslut.com and Spoliamag.com. She has written for The New York Times, The Guardian, The Washington Post, Boston Review, The Los Angeles Review of Books, Architect Magazine, The Globe and Mail, and other publications. Her first book, The Dead Ladies Project: Exile, Expats and Ex-Countries is forthcoming from the University of Chicago Press. She has lived in Ireland, Chicago, Texas, Kansas, and Germany. She currently lives nowhere in particular. "The Creative Tarot . . . playfully reinvents the arcane Renaissance-inspired cards." "Maybe you don’t think astrology or tarot or anything like that is anything more than a case of people falling prey to confirmation bias in order to better figure out who they are. Well, get over yourself and let Crispin enchant you with this beautiful and oftentimes surprising look into the intertwining of tarot and the creative process." "Readers seeking creative inspiration will find this to be one of the most accessible books ever written on the subject." "Crispin presents a persuasive case for the tarot’s usefulness to writers and artists; her many insights into the creative life as well as her dazzlingly wide array of examples throughout make this a valuable reference for readers not remotely interested in the 'psychic arts.'" "Even readers with no previous interest in the tarot will be intrigued and delighted by Crispin’s ardently researched, spirited, creative, and inspiring elucidation."